Community Investment Funds (CIFs) are locally sourced and controlled pools of capital that are capitalized by individual investors within a specific geography or community. The proceeds of CIFs are directed towards a range of businesses and organizations that help achieve provincial objectives such as job creation, small and medium sized business development, and affordable housing. 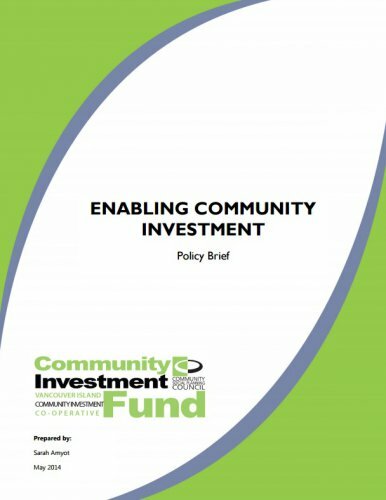 Many community investment funds are enabled by policy tools that include investor tax credits and, in the strongest examples, the articulation of simplified regulatory environment that eases the process of registering and reporting for a community investment fund. Community Investment Funds (CIFs) have demonstrated success in helping provincial governments achieve policy objectives in job creation, small and medium sized business development, and affordable housing development. This is achieved by enabling local residents to form locally-controlled capital pools that provide a vehicle through which accredited and nonaccredited investors can easily invest in their own communities. Currently, four Canadian provinces (Nova Scotia, Prince Edward Island, New Brunswick, Manitoba) have established Community Economic Development Investment Fund (CEDIF) programs or enabling legislation. Collectively these programs have raised hundreds of millions of dollars from local investors and in some cases have had a profound impact on redirecting outward-bound investment and RRSP flows toward local projects. British Columbia currently lacks the policy environment that has been proven to enable CIFs to thrive in other jurisdictions. Specifically, the creation of an investor tax credit and the simplification of the securities process for recognized CIFs would allow open up a new source of capital for community investment. There is opportunity now for the government of British Columbia to create a community investment strategy to enable BC residents to contribute to the health and prosperity of their communities while contributing to job creation, business development and affordable housing development goals. Why is this the right approach for Vancouver Island?